Linking Nominal Accounts in Quickbooks with Accounts in CommuSoft tells the software where to put the data. Without this stage, attempting to send data from CommuSoft to Quickbooks will fail, because it does not know where to send it. Firstly we need to link our CommuSoft Bank Accounts with our Quickbooks Bank Accounts. Go to Company > Chart of Accounts. This will display a list of all of your nominal 'Accounts'. Note, these are not numbers, these are names or descriptions. i.e. in the below example the bank account is called Natwest. The code for the Natwest Bank Account is therefore Natwest. We need to link our CommuSoft Sales Accounts with our Quickbooks Sales Accounts. This will display a list of all of your nominal 'Accounts'. Note, these are not numbers, these are names or descriptions. i.e. in the below example the Sales account is called Accounts Receivable. The code for the Accounts Receivable is Accounts Receivable. We need to link our CommuSoft Expense Accounts with our Quickbooks Expense Accounts. This will display a list of all of your nominal 'Accounts'. Note, these are not numbers, these are names or descriptions. i.e. in the below example the expense account is called Business Licenses and Permits. The code for this expense account is therefore is therefore Business Licenses and Charges. Once you've got your nominal codes (or names) you will need to match these up to CommuSoft. 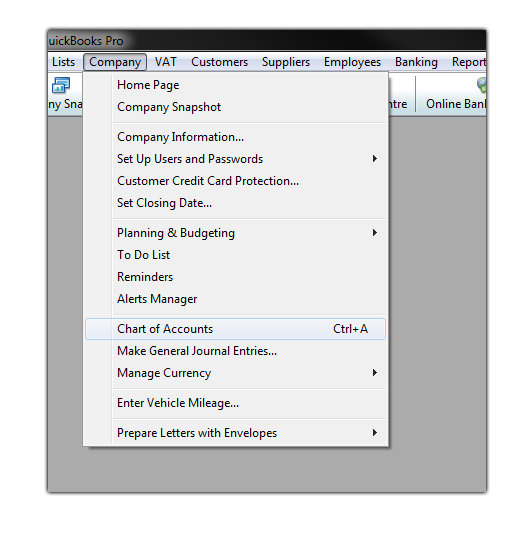 Click 'Edit' next to the corresponding Account, be it Bank, Sales or Expenses. Click Save and that particular Account is linked with Quickbooks.